Letter Month is over, and my letter writing has slowed down quite a bit. I have letters that came in during the first week of March that still need to be returned. I’m slowly making my way through the pile before I go to bed each night. Thankfully, my outgoing mail timing has been good, because some amazing mail has been trickling into my mailbox. My favorite part of the booklet is the line: Jell-O is like the princess in the fairy tale: it is as good as it is beautiful. So true! I remember being so excited when I saw a bowl of Jell-O in the fridge when I was little…my favorite has always been Lime. From reading through the pamphlet, I learned that lime must be a “newer” flavor, as the only five flavors listed in the pamphlet are Lemon, Orange, Strawberry, Raspberry and Cherry. 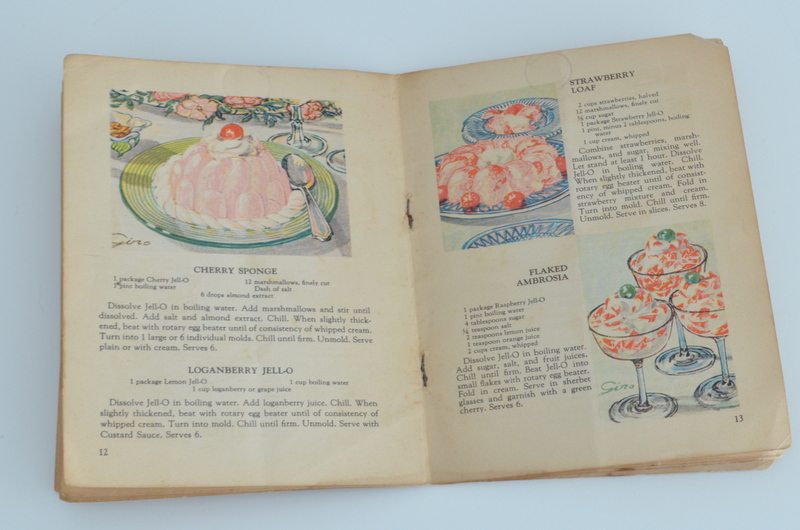 I am completely enamored with the illustrations of the fluffy Jell-O desserts and the perfectly shiny Jell-O molds sitting atop beds of lettuce or whipped cream. 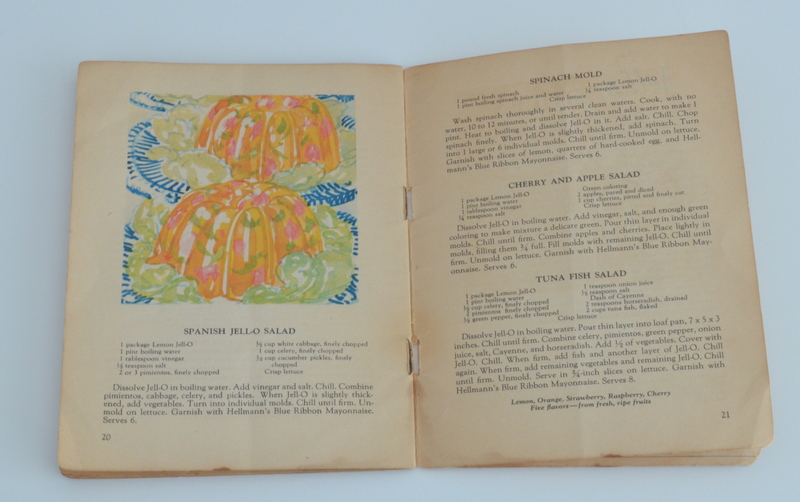 Everything in the first half of the booklet is expected–Jell-O with fruits and whipped cream served as molds or in stemmed dessert glasses. So pretty! 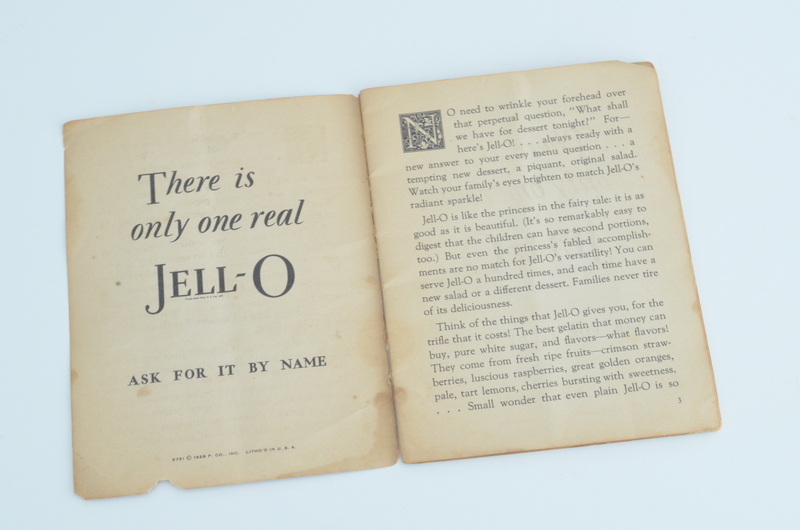 Have you made anything interesting with Jell-O lately? Have you ever had it with olives or meat or other savory bits mixed inside? 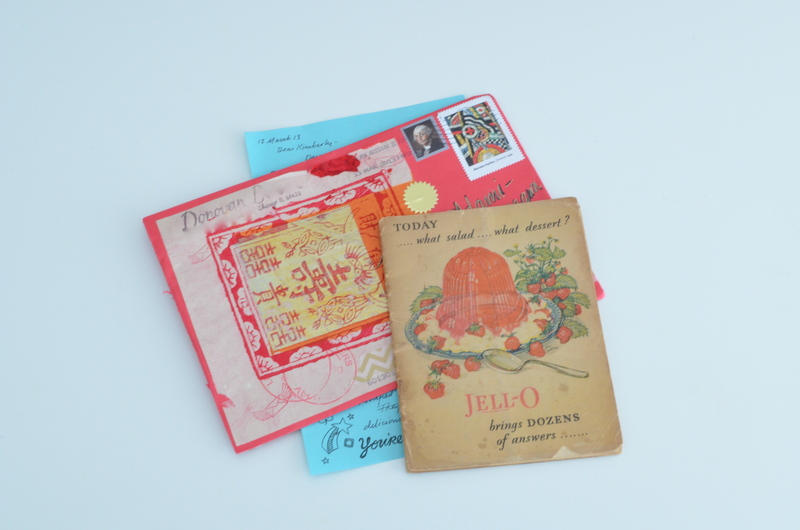 Thanks, Donovan, for the sweet ephemera and for feeding my Jell-O obsession! My favorite Jello recipe is the Poke Cake. So good! When I was a kid, my babysitter used to make a horrible concoction of green jello & california blend veggies. I spent hours at the dinner table because I refused to eat it. Jello with shredded carrots & celery is the only veg. I can remember in Jello. Book does look really cute & interesting.